Ok folkies, I’ve got some very cool news for you! 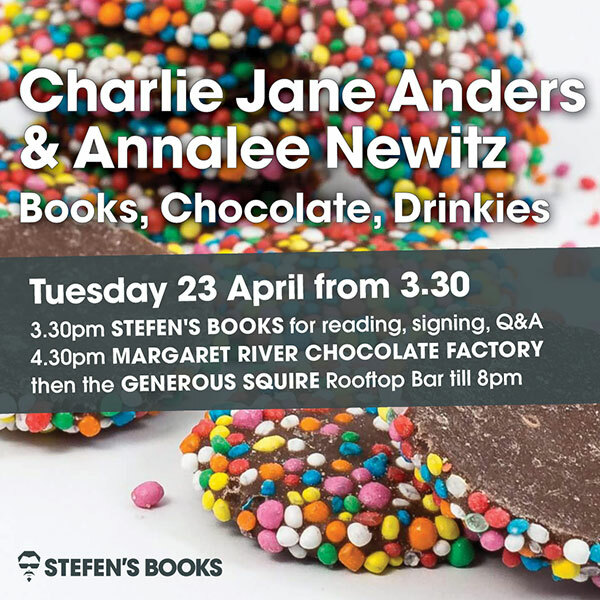 On Tuesday the 23rd of April we’ll be hosting not one but two of my favourite modern spec-fic writers, Charlie Jane Anders and Annalee Newitz. We’ll be starting in the store about 3.30 pm where Annalee and Charlie will be signing books, maybe doing a reading and a little impromptu Q&A. But that’s not all we’re doing. Followers of Charlie’s social media will be aware of her bookshop / chocolate shop events in other cities, and since we’re just down the road from the Margaret River Chocolate Company Murray Street store, we can’t have our guests leave without sampling some WA chocolate. So after the store stuff we’ll be wandering down to show a little local pride and get thoroughly chocolated. After that I imagine folks might feel like a sit down and a drink, so we’ll be making our way to The Generous Squire – James Squire Brewhouse nearby on Shafto Lane where we’ve booked out the Rooftop Bar till 8pm. This is a free event and all are welcome, though because The Generous Squire is a licensed venue, for that part under 18′s must be accompanied by an adult. While RSVP’s are not required, they are appreciated, via Facebook or email.